Part one of a series on transport in Greece. The Company of Thermal Buses (ΕΘΕΛ) has since acquired the trolley company of Athens and Piraeus to form a new venture—it no longer exists in this form. Even so, some statistics on its activities are instructive. 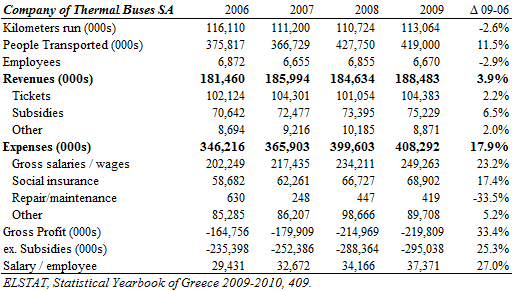 The table below gives the basic numbers (data from ELSTAT, Statistical Yearbook of Greece 2009-2010, 409, here). From 2006 to 2009, the company’s output (kilometers run) was flat but it transported 11.5% more people with the same volume of kilometers. In other words, its buses were fuller. The number of employees declined by 3% from 2006 to 2009 (-202). Looking at the breakdown (not shown) there was a drop in the number of drivers (-319) and ticket inspectors (-48), coupled with an increase in the number of office clerks (+33) and maintenance technicians (+130). The biggest percentage change came from the 15% addition of maintenance technicians. Revenues increased by 3.9%. “Subsidies or grants from the Public Sector or the European Union” make up 40% of total revenues, so it is good to look also at revenues from tickets and other activities (including “advertising, ticket fines, insurance indemnities, etc.”), which increased by 2.2%. So this company carried 11.5% more people but its revenues rose by 2.2%. Receipts per person carried fell by 8.3%. Expenses increased by 18% in 2006—2009. Gross salaries and social insurance contributions rose by 23.2% and 17.4%, respectively (+22% combined). Other expenses showed a modest increase, while spending on repairs and maintenance declined. Excluding subsidies, losses increased by 25% in three years, an additional €60 million, to reach €295 million (2010 losses were €360 million according to the Ministry of Finance). In 2009, revenues from tickets and other activities covered 45% of the spending on salaries and wages, and they covered 28% of all expenditures. To sum: This company transported 11.5% more people from 2006 to 2009, but revenues increased by just 2.2%, so revenue per passenger shrank by 8%. Staff declined by 3%, but costs for salaries and social contributions rose by 22%, salaries per person increased by 27%, and losses increased by 25%. Are you able to clarify from the data whether subsidies were actually provided to cover the entire shortfall between revenues and expenses? 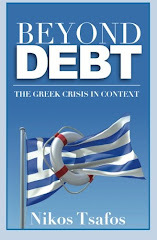 Or is the shortfall covered by off-budget borrowing or by some other non-transparent means? The figures are not at all surprising, given that fares are so cheap but costs for equipment, fuel, and labor are pretty much at comparable Western European levels.... Many transit agencies in the US are also facing enormous fiscal consequences for keeping fares low while providing generous benefits to employees. Nick, I have tried to make full sense of the accounting of public enterprises and I have failed. There are just too many profit/losses or borrowings or subsidies, etc. to really understand what is happening. My sense is that there are some direct subsidies and then, there are loan guarantees that help these companies pay the bills. Transportation in Focus: Attiko Metro S.A.